Every society has its own share of folklore. For the Japanese, Tanabata, the Festival of the Stars, is based on one of these legends. The festival falls on July 7 of each year. The Japanese celebration of Tanabata is based on two stories, one from the Japanese community and the other derived from a Chinese legend. According to the Chinese, this is how the story goes. Once, there was a Heaven God who had a daughter. The girl was named Orihime. She was beautiful and gifted in the craft of weaving (this quality is reflected in a Japanese tale that speaks of a young maiden who weaved cloth for the gods). However, she was lonely because she devoted most of her days weaving cloth beside the River of Amanogawa to please her father. The Heaven God, on realizing this, decided to fix her up with a husband, so that she would not be lonely again. He arranged for her to meet one of the cow herders who worked in the opposite bank called Hikoboshi. However, what the Heaven God did not count on was that the two would fall so madly in love that they would neglect their duties. After getting married, Orihime stopped weaving for her father, while Hikoboshi let many of his herd to wonder heaven. This neglect displeased the Heaven God, and he separated the two lovers by putting them at separate ends of the Milky Way. He made Orihime Vega and Hikoboshi Altair, two stars belonging to two different constellations. The story goes that Orihime was afraid that she would never see Hikoboshi again so she pleaded with her father, who granted her one compromise: provided she worked all other days of the year, she would meet Hikoboshi for one day each year. That day would be the seventh day of the seventh month of the lunisolar calendar. The meeting of the two stars is what the Japanese commemorate as the Tanabata festival. The Japanese imperial court was the first to start celebrating the festival of Tanabata. During the Edo period, commoners adopted the practice and establishing some of the traditions of the seasonal festival or gosekku. Different regions celebrated the festival at various times, ranging from August to July. However, most celebrated Tanabata during the 7th of July according to the Gregorian calendar. I made paper ornaments for the Tanabata (Star) festival with my family. One of my wishes is "I wish to have a barbeque outside. 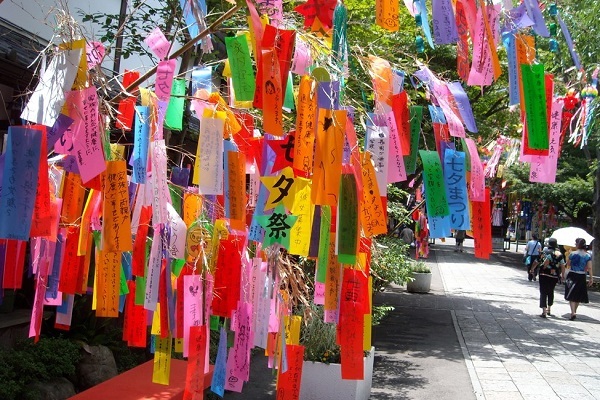 The Japanese usually celebrate Tanabata by cutting long, narrow, colorful strips of paper and inscribing them with their wishes. They then drape these papers, called tanzaku, on bamboo branches. Bamboo branches are tall and straight and are associated with the heavens. People also mark Tanabata by making other shapes, each with its own meaning. For example, fishers make paper nets called toami to bring them luck with their fishing while business people hang up paper purses called kinchaku bags for the prosperity of their businesses. Some people put up trash bags referred to as kuzukago to wish for cleanliness while other make origami cranes called orizuru to lead longer lives. At home, people prepare a special meal for the festival called sōmen, a treat made of long thin noodles and served with boiled okra.